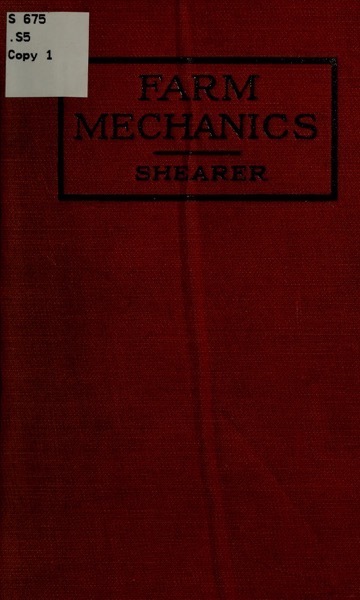 More mechanical knowledge is required on the farm than in any other line of business. If a farmer is not mechanically inclined, he is under the necessity of employing someone who is. Some farms are supplied with a great many handy contrivances to save labor. Farmers differ a great deal in this respect. Some are natural mechanics, some learn how to buy and how to operate the best farm machinery, while others are still living in the past. Some farmers who make the least pretensions have the best machinery and implements. They may not be good mechanics, but they have an eye to the value of labor saving tools. 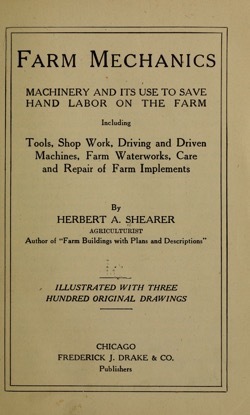 The object of this book is to emphasize the importance of mechanics in modern farming ; to fit scores of quick-acting machines into the daily routine of farm work and thereby lift heavy loads from the shoulders of men and women ; to increase the output at less cost of hand labor and to improve the soil while producing more abundantly than ever before ; to suggest the use of suitable machines to manufacture high-priced nutritious human foods from cheap farm by-products. Illustrations are used to explain principles rather than to recommend any particular type or pattern of machine. The old is contrasted with the new and the merits of both are expressed.